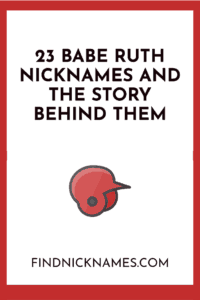 How many Babe Ruth nicknames do you think you can name? Whether you are a fan of baseball or not, I bet you have heard of the Great Babe Ruth. Babe Ruth was recently posthumously awarded the Medal of Freedom, the nation’s highest civilian honor, by President Trump and the question on everyone’s lips was why did it take so long? Babe Ruth was not just one of the best baseball players of all time but also, one of the greatest athletes of all time. Through his many successful years playing for the Boston Red Sox, New York Yankees, and then the Boston Braves, Ruth accumulated many nicknames along the way. Great Bambino, Sultan of Swat, the Colossus of Clout? Yep, they are all the same: George Herman Ruth Jr., The Babe. Babe: The most well-known of all of Babe Ruth‘s nicknames, Babe, came about while Ruth was playing for the minor league Baltimore Orioles. He jokingly became known as, “Dunn‘s new babe” after the owner Jack Dunn had to become his legal guardian since Ruth was only 19 at the time of his recruitment. The shortened form “Babe” caught on quickly. The Great Bambino: While playing in New York, Babe Ruth had a lot of supporters from the Italian community. Bambino means baby boy in Italian. The Colossus of Clout: Literally meaning the giant of hitting long, this nicknames seems fitting for someone who hit around 45 home runs a year, throughout his career. The Sultan of Swat: Sultan refers to a Ruler of an area and swat was regularly referred to for hitting a ball powerfully. Being known as the Ruler of powerful hitting was a perfect nickname bestowed upon Ruth by the press. The Big Bam: Teammates often called Ruth the Big Bam, and the Press quickly caught on using it in their stories and articles. The Behemoth of Bust: Now some might find it a bit insulting to be considered a behemoth—any creature or thing of monstrous size or power—but it was actually an accurate depiction of how people saw Ruth back in the day. A man so great in size and who had so much power, he could crush the baseball right out of the ballpark. Jedge: A nickname given to Ruth by teammate Benny Bengough while playing with the Yankees. It was mostly used by teammates and close friends as a short form of George. The Caliph of Clout: It is no surprise that many of Ruth‘s nicknames refer to him as a ruler at hitting the ball long and out of the ballpark, considering he once hit 60 home runs in a single season. The Wazir of Wham: Meaning the minister of producing a loud sound. Probably refers to the forcible sound made by Ruth‘s baseball bat when it was smashing the ball into the outfield. The Maharajah of Mash: Maharajah means a ruling prince or king and Ruth was definitely considered royalty in the realm of baseball. Being considered one of the greatest of all time, it‘s no wonder most of his nicknames refer to his crushing hitting abilities. The Rajah of Rap: Just one more way fans and the press referred to the great bambino as being a master at bat. The Blunderbuss: Probably referred by this nickname when he was young, naive, and inexperienced in social graces. The Mammoth of Maul: Another nickname referring to Ruth‘s grand size in stature, Ruth‘s swing was like a maul—a heavy hammer—smashing into the baseball. The Mauling Mastodon: Like mammoth, Mastodon was also in comparison to Ruth‘s body size standing at 6 feet 2 inches tall and weighing 216 pounds. The Mauling Monarch: Having a dominant presence in his 22 season span, Ruth was a hammering force setting records that couldn‘t be touched for many years. The Wali of Wallop: Some may have considered him a saint in the world of baseball defeating his opponents thoroughly and winning seven World Series championships. The Prince of Powders: Blowing his opponents away was as easy as blowing powder, it is no wonder this nickname was awarded to the great Babe. The King of Crash: Can you imagine what it must have been like to hear and see Ruth crack his bat against the baseball and blast one out of the park? The King of Clout: A no-brainer nickname for fans to label Ruth as the king of hitting the ball far and long. The Colossus of Crash: Simply put, the Legend. The King of Swing: There is no need for an explanation here the nickname speaks for itself. The Terrible Titan: Most likely referred to by opposing teams, the nickname terrible titan means having a great fear or exciting terror of a person of enormous size and strength. Opponents from opposing teams can relate to the feeling when they would see Ruth step up to bat. The Kid of Crash: Starting his professional career off at the age of 19 meant Ruth was just a kid when he made it to the big stage. He was a young boy with extraordinary abilities not only in batting but also as a pitcher. He was also notoriously known for being horrible with names, so he often called everyone kid. While most of these nicknames mean relatively the same thing, it goes to show how powerful of an impact Babe Ruth made on the game of baseball — He was a master at his craft. At a time in history when the country was struggling through a great depression, Ruth provided the people with a welcome and certainly entertaining distraction from the hardships of life. Being one of the first five inductees into the Baseball Hall of Fame, Ruth will forever be known as a legend in the realm of baseball and beyond. 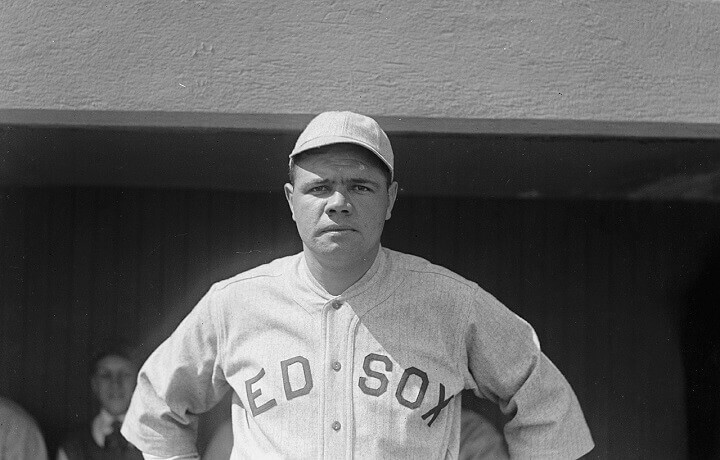 How many of these Babe Ruth Nicknames did you know before today? Think we may have missed some? Let us know what other nicknames for the Great Bambino you have found.